The flight from Chengdu to Guilin is fairly similar to any other flight I’ve been on except for a couple things. Just before takeoff, literally just before takeoff, I guy gets up to take pictures of his friends. The girl beside me pulls out a cob of corn as a snack. The flight attendants hand out beef jerkey for a mid-flight meal. The flight is only 1.5 hours long and we grab a shuttle to Guilin. It drops us off at where we believe is the train station, but we’re not sure exactly and we can’t see any street names so to the map is no help. We walk for a bit past people siitting eatting street food on plastic chairs and there it is: Wada Hostel. Check in to our dormroom, put my stuff into a locker with a painted Chinese flag. We go to the bar for a drink. There’s only a few people in the bar: a really drunk Norwegian girl, a couple Aussies (one who apparently finds out his partner is pregnant that night on the phone), and a 60+ year old Canadian who grew up in Winnipeg, but lived in Kitchener. Only two months ago, his wife of 40+ years died. He sold everything and has decided to travel. Guilin is nice, but it’s still a busy city, not quite what I was expecting. We get up early and find a noodle shop for breakfast (two delicious spicy beef noodle for 10Y). So good. We decide to rent bikes from the hostel. Most have flat tires. We grab two and set out. My pedal is loose and my handlebars turn and wobbles. I return my bike and get another in similar condition. We abandon the bike ride and take a bus downtown. We eat candied fruit on a stick and walk past the sellers to the river. We sit and watch two fishermen on bamboo boats as large black birds (cormorants I believe) sit beside them waiting patiently. 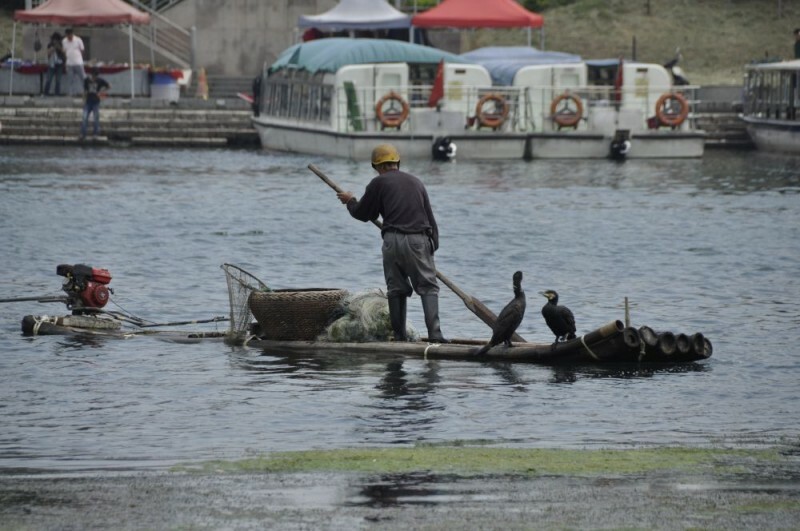 A fisherman with his birds on a bamboo boat in Guilin, China. We walk across the bridge and escape the heat in the Seven Stars park. Pretty gardens, trees and bamboo decorate the pleasent paths. We hike the stairs to the top of two karst hills, large mountains that jut out from the landscape, giving us a nice panorama of the city and its surrounding hills. Many signs say to avoid the wild monkeys, we don’t see any, but I kind of wish we did – from a distance. Catch the bus back and hang out at the hostel. We chat with two American backpackers who are from Minneapolis. They give some good advice for travelling through Southeast Asiia. “How long are you travelling?” I ask. Oh. I leave it there as I envision wealthy parents somewhere in the distance or just many boring nights before hitting the road. But they’ve clearly seen the world, although I don’t know if could travel that long. Beyond missing family and friends, I would miss politics and engaging with the world back home, rather than just touring. You can visit their page at www.livingif.com . Some parts verge on being a little cheesy (but I’m not one to cast the first stone on this charge), yet there are some interesting articles. They wrote their blogs together rather than the hyper-competitive dueling blogs we created. Maybe I’m just envious of the three-year thing, I’m not sure, but it’s definitely made me think. This entry was posted in Asia-Australia 2011 and tagged asia-australia trip, China, Guilin by Darcy Knoll. Bookmark the permalink.